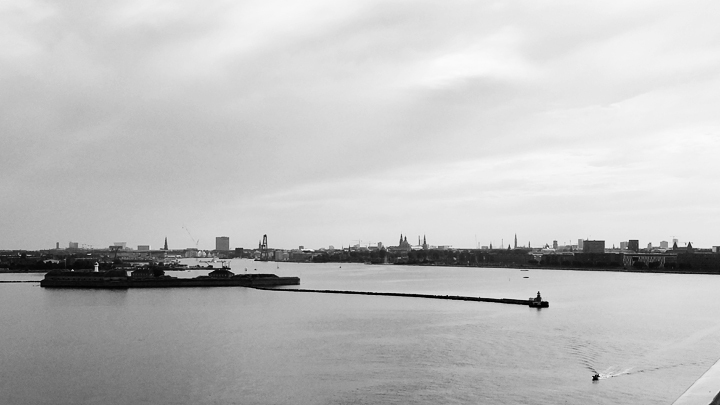 Our tenth and final stop of the cruise was the wonderful city of Copenhagen, Denmark. Fox chose to sit this one out again and stay and play with his new little friends on the boat so it was just Evans party of three. Copenhagen, Denmark's capital, is the gateway to Scandinavia and also its most affordable and fun-loving city. The city is huge, but it has a walkable core which has most of the big sights. We hopped on a local city bus from the cruise port and rode to one of the biggest tourist attractions in Copenhagen: The Little Mermaid Statue. This is one of the most visited and photographed symbols of Copenhagen. The statue was a gift to the city in 1909 from the wealthy Carl Jacobsen to honor one of the city's most famous resident's most famous stories. We snapped a couple a pics and moved along admiring these awesome clouds. Just down from The Little Mermaid is Kastellet Park. The park has some wonderful sights and was filled with people enjoying the wonderful summer weather. At the head of the park is the large Gefion Fountain. From 1908, the fountain illustrates the myth of the goddess who was given a single night to carve out a hunk of Sweden to make into Denmark's main island, Sjælland. The goddess Gefion transformed her four sons into oxen to do the job and with their help took a piece from Sweden and created this island. Also nearby is an Anglican Church made of flint which gave it a very interesting exterior. From the park we headed further into the city center. Just a couple of blocks later we arrived in the center of Amalienborg Square surrounded by the Amalienborg Palace. In the center of the square stands the equestrian statue of Frederick V. He designed this area as part of what was to be a new town called Frederikstaden. This palace is the royal residence of Queen Margrethe II and her husband, while her son, the heir to the throne, lives in the palace building just across the street. Another of the palace buildings that ring the square. Up the street from the square is the striking Frederikskirke, often called the "Marble Church" because of its exterior covered in marble. It was a ritzy church designed to fit in this fancy new town. Also nearby is another cool orthodox church. Love these. As we continued our walk we saw the ultra modern Opera House. It's actually even bigger than it looks because much of it is underground. Its striking design is controversial and not all city residents are in love with it. At least they can't complain about the cost: the building was a $400 million gift to the nation from a wealthy oil-shipping magnate, Henning Larsen. Then we reached my absolute favorite part of Copenhagen: Nyhavn. 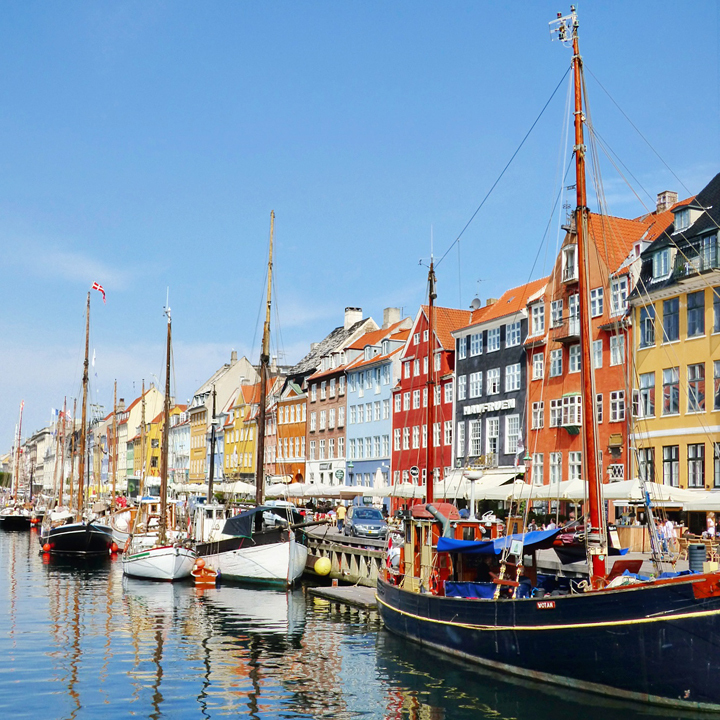 Established in the 1670s, Nyhavn ("New Harbor") is a recently gentrified sailors' quarter. 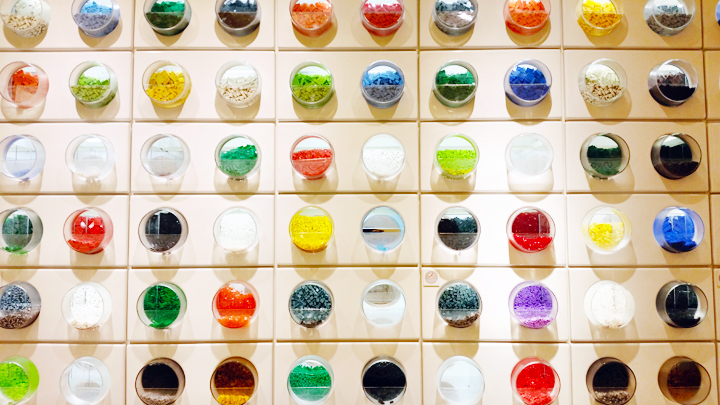 It has trendy cafes, jazz clubs, and tattoo shops, and it is a wonderful place to hang out and just admire the beauty of the multi-colored buildings. The canal is filled with glamorous old sailboats. Historic sloops are welcome to moor here in Copenhagen's ever-changing boat museum. Chris and Paige on Friday August 8th 2015 in Copenhagen, Denmark. Jane was in the stroller and Fox was on the boat. Wow! It took my breath away. After lingering in the sun and just enjoying the vibe of Nyhavn, we continued into the city and passed by the National Theater. We were starting to get a little snacky so we decided to try some of the famous Danish Pølse, a local hot dog. The lady working the cart was excited for us to try all the various toppings so she gave us a dish full of the condiments for us to try. They were very tasty. From here it was pretty much a straight shot down the Strøget, a long, charming pedestrian drag in the heart of the city. The "stork" fountain (which are actually herons) stands in a square along the street. 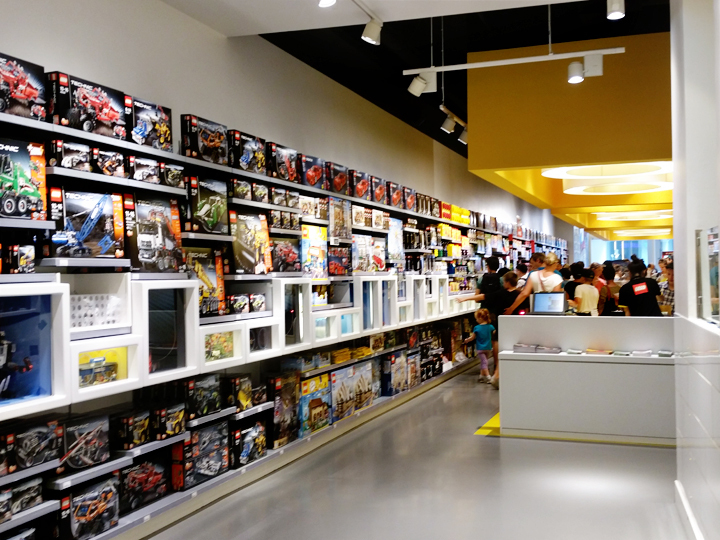 Then we found one of our must-stop sights: Copenhagen's flagship lego store. Yep, we were in heaven. 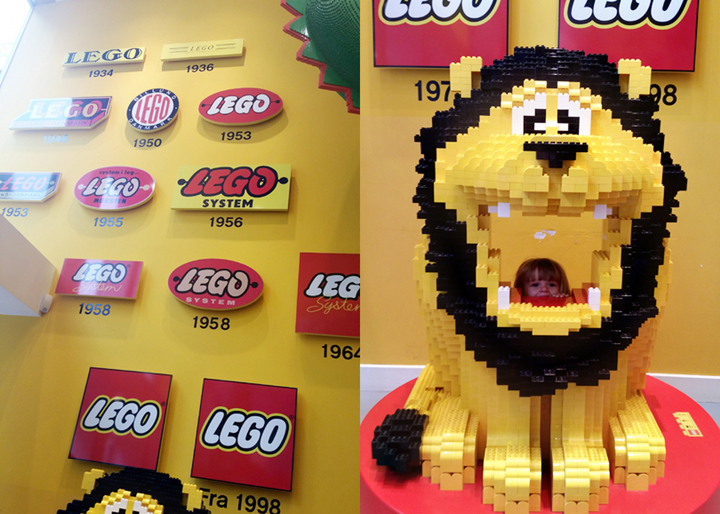 We bought a few little things including a super cool lego minifigure Copenhagen magnet. After getting our lego fix we continued on, somehow missing the church that has the original Christ is Risen statue, a very famous statue in our religion, and made it to the Rådhus, the city hall. Just to the right of the city hall is a statue of famous resident, Hans Christian Andersen, known for such classic fairy tales as The Ugly Duckling, The Little Mermaid, and The Emperor's New Clothes. Oh, and of course, The Snow Queen which Frozen was based on. 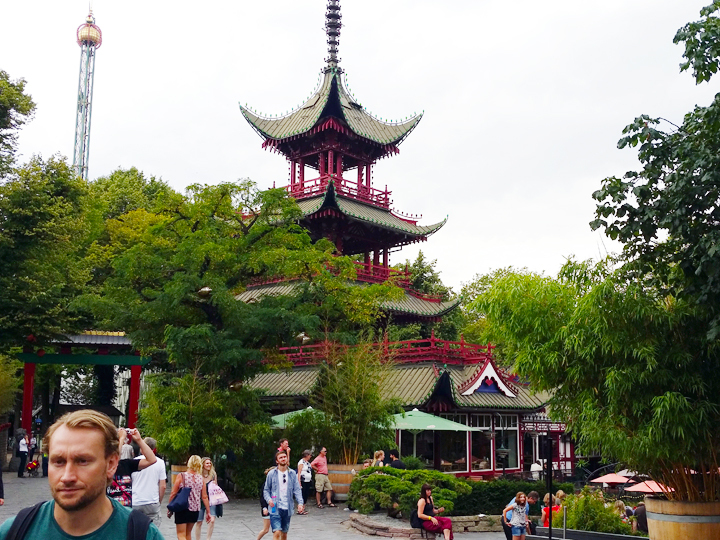 Then we made it to one of the highlights of Copenhagen: Tivoli Gardens! In 1843, magazine publisher Georg Carstensen convinced the king to let him build a "pleasure garden" outside the walls of crowded Copenhagen. The king quickly agreed and Tivoli became Europe's first great public amusement park. The park is 20 acres and has 110,000 lights and lanterns. You pay a low admission price for the ticket and then pay for the rides as well. Such a cool, old-world park. There are fountains and parks, free concerts, pantomime theaters, ballets, acrobats, puppets and other things all over the park. We learned that the way to do it is to buy a mutli-ride wrist band. That is the only way to make this in any way economical. We, unfortunately, didn't learn that until after we had bought several single ride tickets. I think it ended up costing us $6 for Chris and Jane to just ride this one little kids ride. 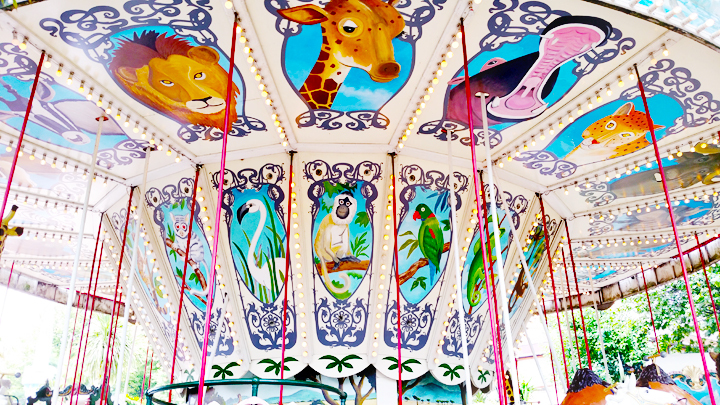 Then we let Jane ride the old-timey carousel. The park has lots of different themes to the buildings, kind of like an Epcot Center mixed with the fun rides of a Magic Kingdom. This roller coaster goes screaming through the tranquil Asian market. We enjoyed the rest of our day in the ambiance of Tivoli Gardens and then made our way back to the boat. 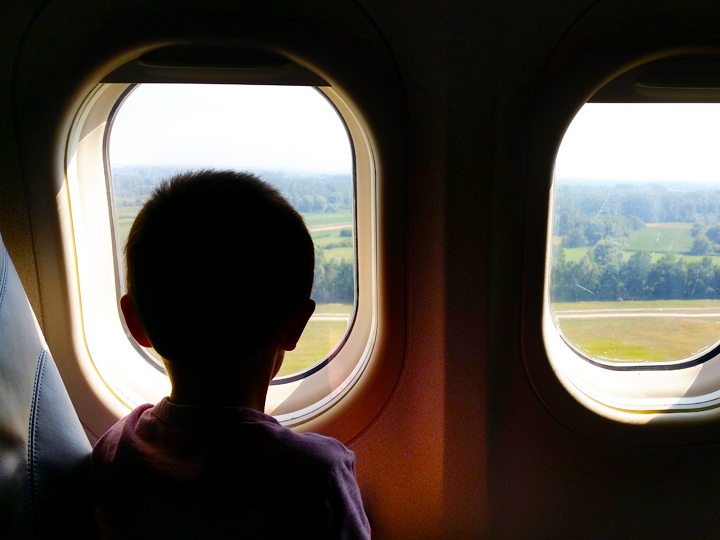 The next day was our last day and we had to disembark in the morning and make our way to the airport to fly home. 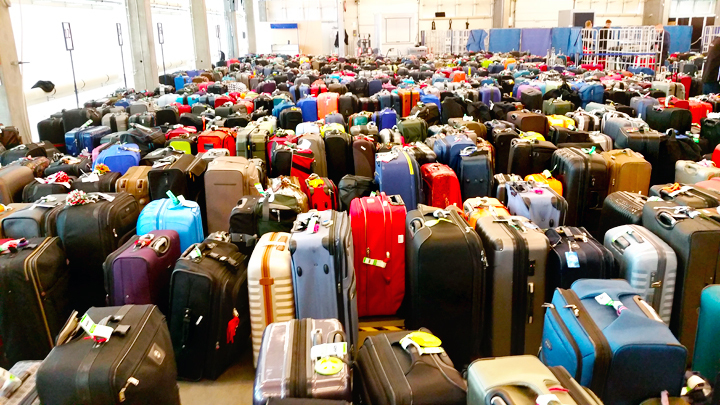 All the luggage from the cruise passengers awaiting pick up. Even the exit process on the boat was smooth and hassle free. Farvel Copenhagen! 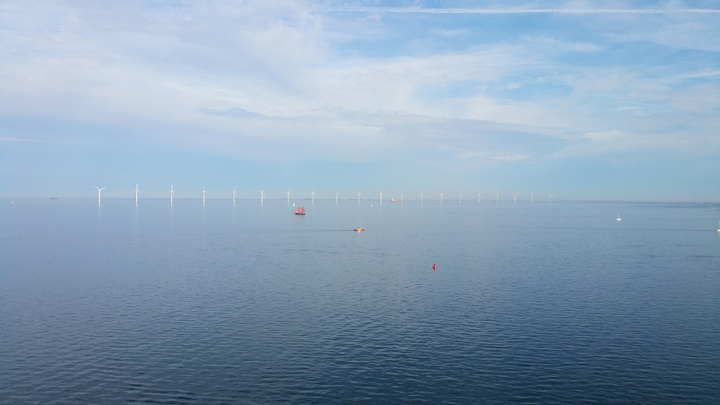 And that concludes our epic, wonderful, incredible Scandinavian/Baltic/Russian Cruise! How FUN!!!! LOVING that park... nothing like the parks we are used to here in the US!! LOVING the Little Mermaid statue too!!!!!! Tivoli Gardens looks like a blast! Airport play areas are my favorite. I really wish more airports had them, or at least bigger ones. Thanks for these gorgeous pictures. I will be there the first week of September. Need to start my research!!! This was one of my favorite cities! I only wish we would have had more time there! Wanna go back?